Inner Rambling of a Mid Life Mama. 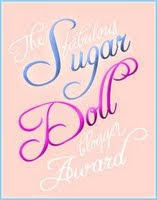 : Sugar Doll Awards.... cute! If you don't already follow Little Ms Blogger then I insist, yes insist, that you go over there now and officially follow that woman... go on.. do it now, you can come back and read my post later.... we no... on second thoughts you may never come back to me so finish reading this first and then go see her. LMS recently... ahem.. like a month ago... gosh time flies... presented me with this award, the rules of which are as follows... (beastly stings attached!!)... I have to tell you ten things about myself which you may not already know and then tag ten other bloggers to do the same. 1) After leaving school I worked for the Gov in England, I was a Civil Servant! little starter job. Although I gotta tell you I was good at it!!! in London for drinks. Which is when I discovered he was a red head. 3) I am addicted to HGTV's Househunters...I know... it's awesome! spills their air on it!!! marrying John just to make sure. wonderful hubby who is also tall dark and handsome ..
.. who needs John, Nick or John??? not me. 7) I am a really good driver, yes I said it, I know it. I rock the road people!!!! was in High School I played the oboe... funny now I think of it. What the heck do you do with that later in life? I was moving to the other side of the world and would miss my girlfriends. evening.... still a memorable day!!! around the world I think I would. He's a good traveler too. therapeutic to dig up these hidden loves, hates and experiences. Well... all right then. Everyone likes a good challenge. I'll probably tell a bunch of lies, though. Oh why thank you! Honesty is the best policy - we accept the challenge - though it may take us a while to come up with something! Congrats!! Well deserved, for sure! Blognut...lies are fun..in the blogosphere, not if they're life threatening or fraudulent or whatever.... ya know!!! Bumbles... take your time, I did!! and I know you already have a busy blog schedule, I can wait! GEM.. thank you, I love these things! Hey, thanks for that. It was interesting. what a great list... and so much fun to read! happy weekend... oh and if i see john, i´ll send him your way. Oh Alli! Dunker Shine... hee hee! You know I will do this... Don't know if I can pass it on or anything... But I will reveal 10 things. Kinda challenging after the 30 Secrets! Jane... tell him to bring wine pls. Stacey...the challenging part is sooo the passing on. It was like a freakin' blogathon last night all that linkin' and commenting and blah blah blah... I'm whipped this morning! I had never thought of fart germs..new one to add to my list! Hey, is that Moonstruck Nick Cage or the older Nick Cage? These are always so much fun -- learning more about our blogging friends. Congrats on the award and thanks for passing it on to me! No I think the National Treasure Nick and Family Man Nick are what I look for in a man! Mari..I'm still not ready to let JT go altogether but will keep you posted. Check with me in six months or so. Do you ever wonder if you could still play the oboe? I miss my French Horn. I am also a germaphobe, but I always get sick anyway? So what is the point? Thanks for thinking of me McGillicutty. I am not sure you all don't already know everything there is to know about me by now. I mean, I AM an open book. But I'll give it a shot sometime soon. P.S. Fart germs? I'm so with you on that. Just stop breathing!! Liar.... I have a friend who actually makes it a point to only breathe through her nose!!! funny stuff!! !